NRMA Motoring & Services unveiled its first electric roadside assistance vehicle and mobile electric car charging station today in a bid to support the ever-growing electric vehicle market. 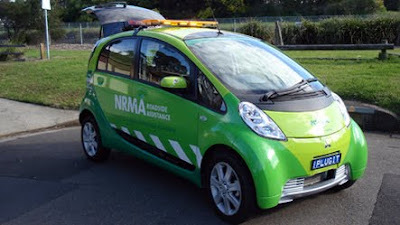 The NRMA's first electric roadside assistance vehicle, the i-MiEV, will be trialed in the Sydney CBD from early September after completing a six week tour of the state, showcasing the benefits of electric vehicles (EVs) to some of the NRMA's 2.3 million Members. In an Australian first, the NRMA will also launch the first mobile Electric Vehicle charger to rescue Members if their EV battery goes flat. The mobile charging station will recharge an EV battery to a point where Members can drive their car to a dedicated charging station for full charge. NRMA Motoring & Services President Wendy Machin said she was delighted to announce the NRMA's first electric roadside assistance vehicle, marking the mutual's transition to cleaner and greener fuels. "The NRMA's i-MiEV is a further step in greening our Patrol fleet, which would assist in reducing greenhouse gas emissions," Ms Machin said. "It will help us understand our Members' EV needs as part of our regular roadside assistance network in the city and will service both electric and regular vehicles. "Our Patrol workers have been trained on servicing electric vehicles to ensure the NRMA is keeping pace with emerging alternative fuels technology," said Ms Machin. The i-MiEV will be on trial for approximately six months and will provide the organisation with much needed data about the costs of running and maintaining an electric vehicle as well as the practicality of this new technology. The NRMA has installed a charging station for the i-MieV at its Wynyard office and North Strathfield headquarters in partnership with Club Assist, the provider of car batteries, car electrics and auto glass services for the NRMA. Club Assist's COO Mr Steve Grossrieder said Club Assist is thrilled to have partnered with the NRMA as their preferred supplier in bringing EV mobile charging technology to NRMA Members. "Club Assist continues to lead the way internationally in the Electric Vehicle arena. We are a dominant leader offering expertise and professional advice in EV Charging Systems to motoring clubs globally," said Mr Grossrieder. "We look forward to working with the NRMA in the future to bring this service to all NRMA Members." "We see the electric vehicle revolution as the best way to reduce our dependence on imported oil and the associated price volatility," said Ms Machin. "If EVs are powered with renewable sources of electricity, these vehicles will ultimately reduce the transport sector's contribution towards Australia's greenhouse gas emissions." The hybrid Toyota Prius has sold more than 8,327 vehicles since 2008. The first i-MiEVs for sale will arrive in August this year at around $50,000. 110 Mitsubishi i-MiEVs have been leased in Australia since 2010.